Wrap your gifts and make them more stunning with our luxury, high quality personalised wrapping paper with photos. Design your own wrapping paper, ideal for your gifts for friends, Mum, Dad and all the family. Print photos unique design, art and words to create your thick luxury custom wrapping paper. The gift experience starts before opening making the gift extra special. Turn your Facebook, Instagram and camera roll photos into personalised photo wrapping paper. 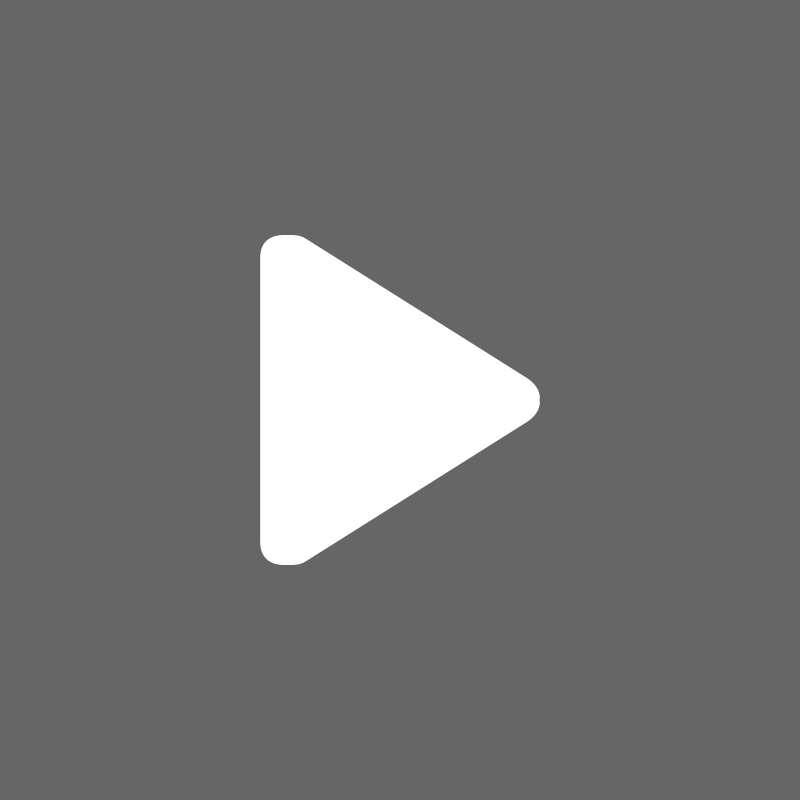 Create a sheet or a roll and design online right here. At Bags of Love, we get very excited when it comes to presents. So much so, that we decided to make giving gifts just about as amazing as it can get; by creating our very own gift wrapping. Had a really speedy service from Bags of Love - 4 different orders & all very prompt. Lovely gifts too - really pleased with them - quilt cover, lunch box, flag & wrapping paper. The wrapping paper is very good quality. The print quality and the paper are excellent. it was printed and posted in good time. came rolled and in a sturdy postal tube. me brother will love it wrapping his 60th birthday present. will definitely be back when another special occasion occurs! With Bags of Love, it is easy (not to mention fun) to design your own wrapping paper. Once you have decided to give it a go, have a think about who the paper is for and what the occasion is. For a new parent, opt for photos of their brand new bundle of joy. For mums and dads or grandparents, create a design using the kid's own artwork. For your best friend, why not create photo gift wrapping as a collage gift wrap, featuring a selection of your favourite snaps and even some memorable messages? Next, upload your chosen design to our online interface. Choose your size and folding option and have fun perfecting your design with the easy to use tools. 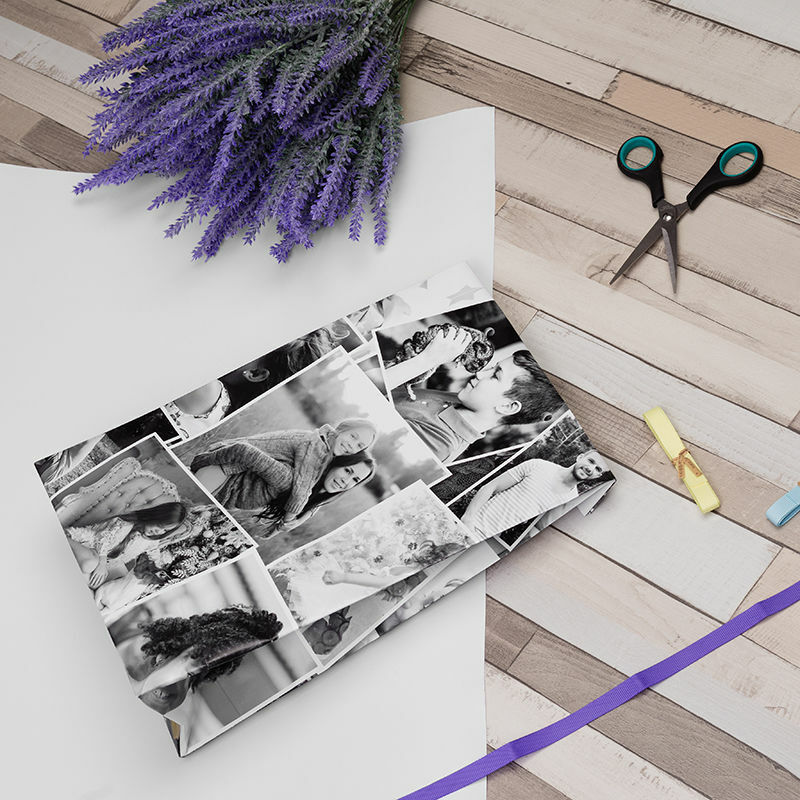 For the collage gift wrap, you can simply use our montage tool and try out different styles. You will never want to buy generic gift wrap again. Deck your gifts with personalised Christmas wrapping paper, fa la la la la la la la la! That might not be quite how the song goes, but just think how amazing your gifts will look under the tree, wrapped in their very own personalised Christmas paper. Forget having to label your presents, you can make your own Christmas gift wrapping and the recipients can guess which gifts are theirs, based on your designs. Or you can print each person's face onto the gift wrap for their presents. You can check out our blog for Christmas wrapping ideas, just remember to keep it personal and keep it special with a luxury paper you can print on. 'Tis the season after all. At the moment, we have two sizes of Personalised Wrapping Paper available; 61 cm x 79cm or 61 cm x 158cm. We will be introducing more size options soon, but these sizes are perfect to get you started with your wrapping needs. We send your photo gift wrap to you rolled and can also be ordered with automatic quantity discounts, so, the more rolls you buy, the less the unit piece costs. Our personalised gift wrap is made from beautiful, high-quality paper, which is a dream to fold and stick. You can print your own wrapping paper very easily by just uploading your design, photos, artwork or text and before you know it, you will have created something, which your gift recipient will love as much as the gift itself. We print your gift wrapping ourselves, in our London studio, so you can be sure that you will be receiving a gorgeous and perfect product. Our new Personalised Wrapping paper is no ordinary gift wrap. We get annoyed when we are wrapping presents and the paper rips or tears as you grapple with it. That is why we decided ours needed to be strong luxury wrapping paper. 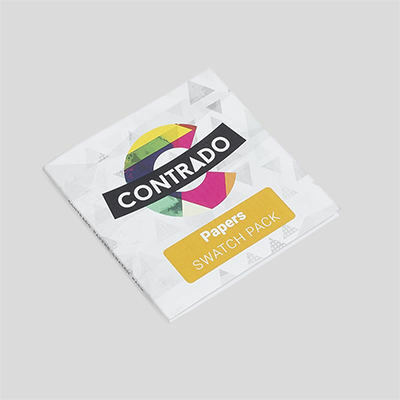 Our thick paper weighs 140gsm and is an absolute joy to use (and open). Perfect for all of those Christmas presents you will soon be wrapping up; make sure your gifts look the best and the most tempting. Whatever gift you are wrapping, make sure it looks its best. Our Personalised Wrapping Paper is perfect for all occasions and all kinds of presents. Remember it's not just personalised Christmas paper. It's also perfect your Valentine's Day presents with some lovingly made Valentines wrapping paper for your special someone. Even if you are just wrapping up a box of chocolates, once they see their own bespoke Valentines gift wrap, they will melt faster than the Wicked Witch in a bath. Do you have a special someone's birthday coming up? Make their gift really stand out with their own personalised birthday wrapping paper. Old or young, guys or girls, happy birthday paper will be the perfect finishing touch to their present. If you know a little one who is about to turn one, mark the occasion (for baby and for mummy) with their very own 1st birthday gift wrap - just make sure the parents open it, so your gorgeous paper doesn't get destroyed by eager and uncoordinated hands. What about weddings and anniversaries? A newlywed couple or loved up marrieds will be blown away to receive gifts wrapped up in personalised wedding wrapping paper. Upload photos from their special day and heartfelt messages to create a gift, which is sure to bring a (happy) tear to their eyes. For wedding gift wrapping ideas, why not create a design based on their loves and interests? From hobbies to holidays, friends to fast food, something personal to the couple is sure to make your gift stand out from all of the others - they won't even care what is inside. When Mother's Day comes around, wouldn't it be nice to treat mum to something other than chocolates and flowers? At the very least, you can wrap those choccies up in her own Mother's Day wrapping paper. She won't be able to keep the tissues at bay when you present her with a gift, wrapped up in her own personalised Mothers Day gift wrapping. 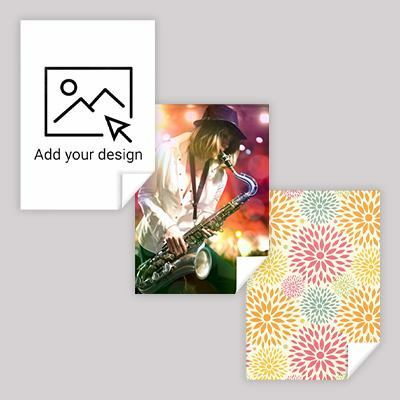 Photos of you, her grandchildren, the cat, whatever is her favourite thing in the world; create a design and print your own gift wrap for lots of extra brownie points. One very interesting comment from a customer was that they reused the custom photo wrapping paper to make a poster. After carefully removing the sticky tape (our paper is thick and glossy so this is easy), they ironed it and put it up on the wall as a poster. Double the value right there. Custom laptop stickers, in sheets of 15 or 35 stickers. Can be different designs or the same. No minimum order, made in UK.